Unless you’ve been living under a rock, it will come as no surprise that eco-friendly beauty has become incredibly popular. (Actually, if you’ve been literally living under a rock, you are probably already the ultimate environmentalist. But I digress.) Beauty companies are going to the ends of the earth to take out ingredients that could potentially harm humans or the environment, and ditching packaging that could be considered excessive. But, what if, by eliminating just one key ingredient from the formulas, you’d be able to make your products significantly cleaner and more eco-friendly? And what if that ingredient was typically the very first one on the back of the bottle? That’s right: “Take out the water and you can eliminate a bunch of the nasty ingredients,” says Carrington Snyder, who is the founder of PWDR™ Cosmetics and, not for nothing, the former managing attorney for a law firm known for its work protecting consumers against toxic environmental exposure. One thing you won’t reduce, though, is efficacy. Powdered skincare is literally not watered down. And some of the most active skincare ingredients — vitamin C, B vitamins, hyaluronic acid — really lend themselves to a powder format because they are water soluble, meaning they can be dissolved in water. Bonus: The lack of liquid makes them all TSA-friendly, too. With the latest launches — and a few older favorites — you can practically powderize your entire skincare regimen. Wet hands are the way to go with powdered face washes, and that paltry amount of moisture is typically all you need to activate a light lather. Bonus: Most just-add-water cleansers have mild exfoliating properties because of their granular textures. Look for clays, charcoal, and rice starch to do the heavy dirt-lifting action, like in PWDR Step 1: Wash ($45), which uses both kaolin and bentonite clays. Kaolin is also a star of the Clinique® Fresh Pressed™ Renewing Powder Cleanser ($30), which pairs it with pure vitamin C for a brightening boost. Daily doses are individually wrapped (and strongly resemble packets of artificial sweetener) so they can easily be tossed into a gym bag or weekender tote. The Josie Maran® Argan Exfoliating Cleansing Powder ($40) uses rice starch, papaya extract, and salicylic acid for a pore-purifying clean. A similar slate of ingredients is the basis for powdered masks — lots of oil-absorbing clays, exfoliating acids and enzymes, and antioxidants aplenty. We recommend you get out a bowl and whisk to whip these up, as they’re a little messy to mix in your palm. 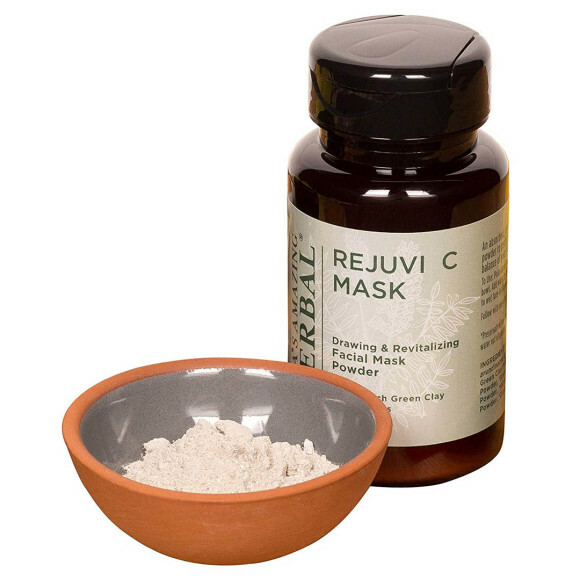 Ora’s Amazing Herbal™ Rejuvi C™ Mask ($24) uses French green clay plus vitamin C for tightening and brightening. You’ll find two types of clay in Ranavat Botanics™ Kiss of Royal Tea® Hydrating Masque ($65), as well as Manuka honey, a natural humectant. But we’re especially fond of Odacité® Synergie  Immediate Skin Perfecting Beauty Mask ($59). It is the mother of all masks, with two kinds of clay, activated charcoal, vitamin C, papaya extract, and fruit acids to get rid of every speck of pore-clogging, skin-dulling debris. 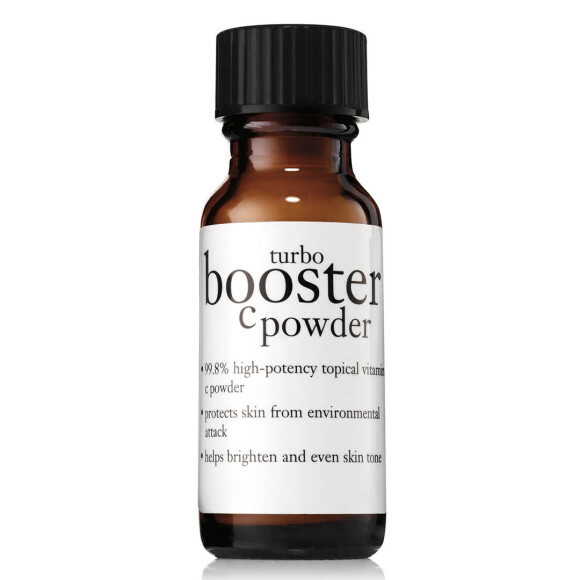 The majority of treatment powders are typically comprised of vitamin C to brighten skin and help even out skin tone. Mary Kay® TimeWise Vitamin C Activating Squares® ($24) have been available for a few years, but this formula is still one of the coolest dehydrated vitamin Cs we’ve ever seen: They’re tiny square tabs that you place in your palm, add a few drops of water, and then a squirt of serum onto, creating a fresh mini-batch every day. Similarly, a scoop of Philosophy® Turbo C™ Powder ($39) can be mixed with any serum or moisturizer to add a boost of radiance and free radical defense. Vitamin B3 (also known as niacinamide) can be tough to find in powder form, but it’s worth seeking out — it helps reduce the look of hyperpigmentation, lines and wrinkles, and skin’s texture. PWDR H20 Serum Powder To Gel Treatment Serum ($165) pairs this powerhouse ingredient with hyaluronic acid, which increases skin hydration for a temporary plumping effect. 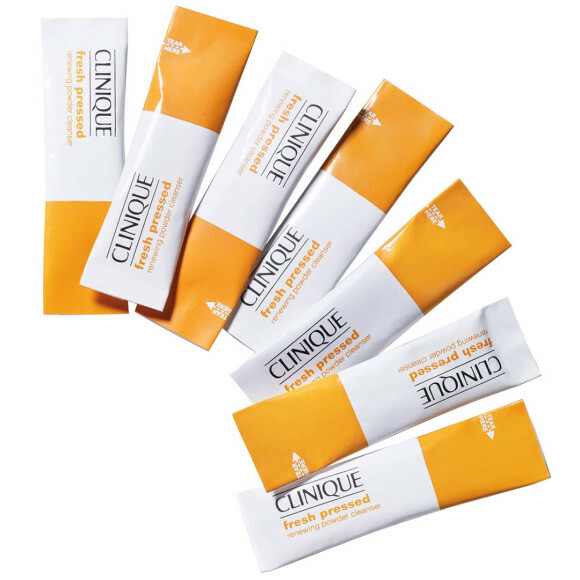 Sunscreens are the one powder skincare category for which you don’t add water, because diluting the formula would decrease the SPF, and you couldn’t be sure you’re properly protected. Sunscreen powders are powered by two minerals — zinc oxide and titanium dioxide — that are generally considered to be the most safe and effective options for protecting your skin against UVA and UVB rays. It should be noted, however, that the FDA recently announced its plan to consider (among many other proposals) whether the powder sunscreen format should be included in its monograph, or its list of accepted ingredients, doses, labels, and formulations. The current monograph doesn’t currently address different formats. This is not to say that powders aren’t safe; simply that they haven’t been discussed and decided upon yet. So, with all that FDA legalese out of the way, let’s pick a few powders, shall we? These are all perfectly portable, come with built-in brushes, and go on over makeup so you can reapply any time . . . and you should be reapplying at least every two hours! (Sorry, nag over.) The Tarteguard® 30 Mineral Powder Sunscreen Broad Spectrum SPF 30 ($28) goes on completely sheer and contains vanilla to deliver antioxidant protection and a delicious scent. 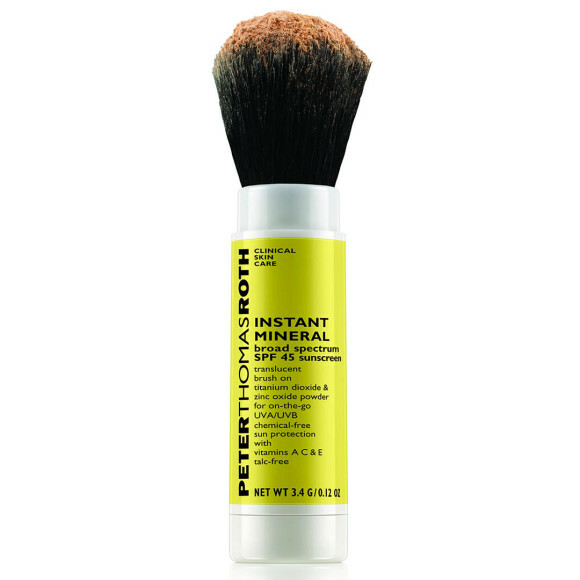 PeterThomasRoth® Instant Mineral SPF 45 ($30) features an even higher dose of SPF, plus packs vitamins C and E to fight free radicals. And if you’re looking for a little color with your coverage, Colorescience® Sunforgettable® Total Protection Brush-On Shield SPF 50 ($65) comes in four different shades.